Time to lift your samurai spirit! – CIPANGO Goes to Paris! Artisan Keisuke Miyake, with his upbringing from traditional Japanese doll craft from centuries ago, dedicates to pass on the esthetics of true samurai culture allowing a completely new portable approach integrating detailed hand knitted samurai armor wear craft with rich colors and design. Righteousness, Courage, Benevolence, Politeness, Truthfulness, Honor, Loyalty. The 7 codes of the samurai have always strongly resonated in our imagination as the ultimate code of ethics. 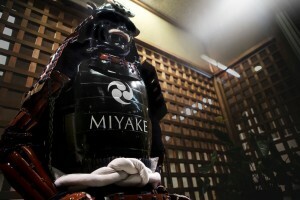 The armor of the samurai, while designed to impress, inspire and respect is to embody those values. Now CIPANGO is honored to share the opportunity to match those values with your daily lifestyle and to carry with you a part of Japanese history. CIPANGO will be attending the MIYAKE booth throughout the exhibition at your service to represent sales and marketing for international business as well as personal interests of MIYAKE products. So please take this rare opportunity to come around to get the real feel and look of samurai armor crafts. This precious craft is without saying, an incomparable brand value to add to your original life style. We look forward to seeing you in Paris to share this exciting opportunity to discover MIYAKE’s amazing bags and crafts lifting your samurai spirit by visiting Maison et Objet exhibition in Paris! Should you have any MIYAKE purchase and/or business inquiries, you are more than welcome to contact us at sales@cipango.co.jp.